Thomas Jefferson Middle School has many terrific Design technology classes including: Computer and Internet Technologies, Digital Input Technologies, Design Tech-Computers,Technology of Robotics, Investigating Computer Science, Inventions and Innovations, Life Management, Technological Systems and Teen Living (see the full description of these classes below). Our students are 1:1 with Ipad devices for use in all their classes. Teachers and students use software and Internet tools to create multimedia presentations, desktop publications, Webquests, and movies. The students also broadcast a morning announcement show over closed circuit television. Technology obviously plays a huge role in Jefferson’s Middle Years IB Programme. The Design Cycle trains students to look at the big picture of learning and to have a personal stake in their own education. Students learn to investigate, plan, create, and then evaluate three branches of technology: information, materials, and systems. With technology at the helm, students become leaders in the classroom. 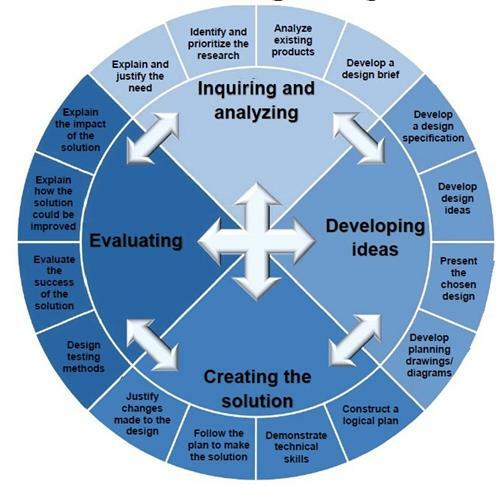 The Design Cycle (shown above) is taught explicitly in our Design courses (Business Education, Family and Consumer Science, Technology Education, and with the Chorus, Band, and Orchestra year-long courses. The Design Cycle trains students to look at the big picture of learning and to have a personal stake in their own education. Students learn to investigate, develop ideas, create solution, and then evaluate results. With technology as a helpful tool, students are able to be creative and critical thinkers. Computer Applications and Internet Technologies – This course is designed for students to develop real-life,outcome-driven approach skills for digital citizenship,basic computer operations, keyboarding, application software (word processor, spreadsheets, multimedia applications, databases), and career exploration. Thiscourse promotes skills that can be applied across the curriculum and offers preparation relevant to 21st century skills used in business and personal life. Digital Input Technologies – Introduces new and emerging input devices (e.g., speech- and handwriting-recognition software, tablets, cloud computing software applications,headsets/microphones, scanners, digital cameras, digital video cameras, mobile devices, keyboards, mice) to prepare students for using tools that are becoming standard in the workplace and everyday life. Exploring Business & Information – Technology Students are introduced to beginning keyboarding,microcomputers applications. And career exploration.Students learn proper keyboarding techniques including the touch typing method, speed, accuracy, good organizational skills, composition, language arts, and proper use and care of equipment. The Virginia Department of Education Technology Standards are integrated in the course content. Exploring Family and Consumer Sciences – Exploring Family and Consumer Sciences prepares students for the demands of 21st century living. This course provides a foundation for managing individual,family, career, and community rules and responsibilities. Life Management – This course teaches higher order thinking skills through simulated life experiences such as family role playing and caring for children, evaluation of short-and long term goals, and assessments of different techniques to balance work and family. Students also complete various modules in a self-directed multimedia lab. Investigating Computer Science (Coding) – This course will develop the students’ coding, computational, and financial and digital literacy knowledge and skills while learning Computer Science concepts to design and write computer programs to solve business and real world problems. The curriculum includes computer coding using Programming (coding) with Java, Scratch, HTML, Java Scripting, mobile apps, an introduction to text based programming using python and/or Java languages and web page development. The integrated projects will have a “real-world” math and financial literacy application focus. Technology of Robotic Design – Students engage in the study and computers and microprocessors and their applications o manufacturing,transportation, and communication systems. Topics include computer equipment and operating systems,robotics, programming, control systems, and social/cultural impact of these technologies. Problem-solving activities challenge students to design, program,and interface devices with computer systems. Learning activities include robotics, computer aided design,computer aided manufacturing and design, and control of electromechanical devices. Technological Systems – Students investigate how technological systems work;identify the parts of real-world systems in a variety of technical fields; and design, build, and evaluate systems through class projects. By designing and building systems and assessing their impacts, students gain insight into how to approach the problems and opportunities of a technological world. The course includes activities where students employ the engineering problem-solving process, use design software to develop solutions, and apply industrial process in creating multi-part projects. An example is the CO2 Drag Racer Project, where students design using sketching and AutoCAD; drill, cut, sand, andfinishing models in the materials processing lab; and then perform speed and wind tunnel analyses. Yearbook – In this course students produce the school yearbook.Through their work, students learn about publication writing and production.